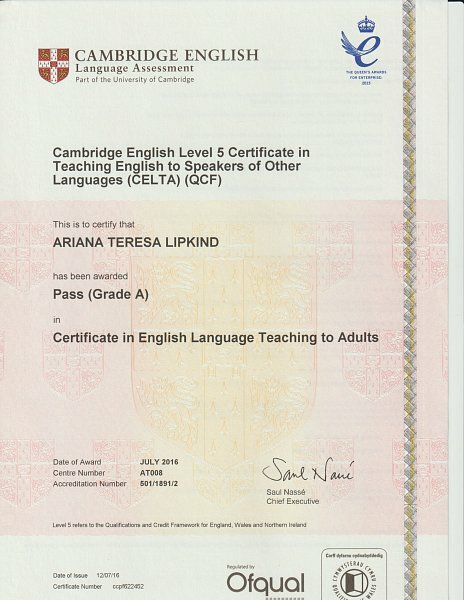 I am a CELTA certified English teacher originally from the United States. I have experience with students of all ages and levels, in schools and as a private teacher. My unique teaching style is fun and personalized to your specific needs and desires! Whether you need help for school, university, work, or personal interests, I can help you reach your goals. Hi, Ariana was a very good teacher for my children. I can highly recommend her. Hello, I got tutoring lessons from Ariana Lipkind. Especially, American pronunciation and diction. It was a very nice lesson. I am happy to say that I have had a wonderful improvement in English pronunciation and conversation skill in a short time. This thanks to her best teaching experience. She is flexible and knowledgeable. Thank you. Falls Ariana nicht antwortet, meine Anfrage automatisch an weitere Nachhilfelehrer senden.